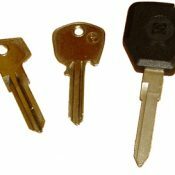 A key for any Daimler car manufactured between 1946 and 1995 cut to number or photo, except those with a high security key. Models Include: Double Six Coupe, Sovereign, Limousine (all prior to 1990). We do not use original Daimler blanks, we use high quality steel blanks manufactured by Silca.